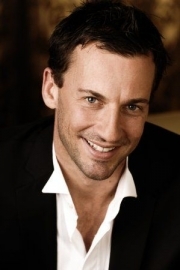 Craig Parker is a New Zealand actor who was based in the United Kingdom for some time, but now resides in New Zealand. His grandfather moved from Edinburgh, Scotland to Fiji when he was stationed during his years of service in the British Army. Apart from Scottish ancestry, Craig Parker has Welsh, Danish, English and Cornish ancestry. Parker is most famous for his role as Haldir of Lórien in The Lord of the Rings movie trilogy, his performance of Bellerophon in the show Xena: Warrior Princess and playing Darken Rahl in the TV series Legend of the Seeker. He also does voice-overs for New Zealand documentaries and has been entertaining and meeting fans at various Lord of the Rings-related conventions for several years - for example, Ring*Con in Germany, which he has attended every year since its creation in 2002, with the exception of 2007, when he had to cancel his appearance due to pressing acting commitments. His recent work has also involved voiceover work in the recent Power Rangers series since the filming moved to New Zealand. He is currently starring in the TVNZ soap Shortland Street, as Guy Warner, from which his character has been absent for 11 years. He has an older brother named David, and he also has an older sister. He is the reigning champion of New Zealand's Celebrity Joker Poker. Parker starred as Darken Rahl in Sam Raimi and Rob Tapert's syndicated television series Legend of the Seeker, in which he has earned an equal, if not more, amount of attention as Lord of the Rings. He also appears as Gaius Claudius Glaber in the Starz original series Spartacus: Blood and Sand which premiered on 22 January 2010 and is also produced by Sam Raimi and Rob Tapert. As of March 20, 2011, it has been confirmed that he will return for another season of Spartacus. Whole or part of the information contained in this card come from the Wikipedia article "Craig Parker", licensed under CC-BY-SA full list of contributors here.